You have a story that you tell yourself about every situation, and that’s what creates the movie you call your life. Is the story unfolding as you imagine, or would you like a different plot? Claiming our role as “Director” of our lives is the first step to learning what hidden scripts secretly drive our choices on a daily basis. Are you taking charge of the set, or are you waiting for someone to tell you what to do? 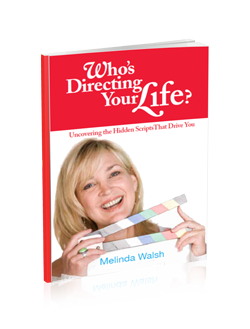 In Who’s Directing Your Life, author Melinda Walsh shares tools she learned through her years in the film production business that apply equally to life. For example, what roles do you unconsciously play? Are you a mouse when you really need to be a warrior? Learn how the thoughts you think and the lines you speak can keep you as an extra when you really want to be the star.